India is a land of sweet delicacies; from weddings to festivals, the aroma of Motichoor Laddu, Badusha and gulab jamun fill the occasions. So what makes sweets an integral part of Indian culture and festivals? Let us checkout. The essence of sweets is ever growing in India. When you need to say thanks to someone, give the good news of marriage, child birth or good results, it is the perfect way to do so. The sweetness of this Indian dessert is directly related to happiness and thus at each and every happy occasion Indians say,‘Mu Mitha Kar Lijiye.’ A box of G. Pulla Reddy kaju kathili can melt anyone’s heart. Sweets are generally made with sugar, ghee and milk. These are considered as sacred ingredients in Indian culture and can be eaten by anyone, even the sages and vegetarians. This is another reason sweets are offered to the Gods and Goddesses while performing pooja rituals. Sweets like Doodh Peda are just not used for worshipping but also sent to long distances as prasad. 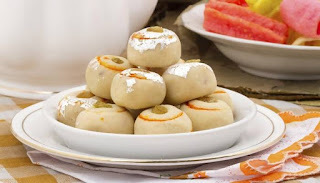 Doodh Peda is made in such a way that the sweet remains fresh and fine for a long time span. Another reason for choosing sweets for festivals is that these are filling. During Indian festivals people fast for days. Sweets are heavy and eliminate the need of having rice or chapati. For this reason, sweets have become a must in any festivity. This is another important factor why sweets are so popular during Indian festivities. As sugar, ghee, milk blend together, an awesome soft texture and taste is created. The lip smacking taste of sweets makes these a part and parcel of any occasion. The sweets are available in an infinite range; while some are dipped in exotic sugar syrup (like gulab jamun), others come with the skills smoothness and coolness of ice cream (like the Ice Cream Burfi). Sweets match the grandeur of Indian festivals. These are available in a plethora of colours; while the Coconut Santra enhances the beauty of the pooja thali with bright orange hue, Badam Halwa dazzles the eyes with its yellow texture. Even the sweet boxes are made attractive to give a festive look. Online stores allow you to send the sweets in special gift wraps and with personalised messages directly to the recipient. Last but not the least; sweets are good for health. The sugar composition of sweets boosts energy. Sweets keep you filled for a long time and thus reduces the craving to have unhealthy snacks through the day. As made from milk, gram flour, rice flour and nuts, sweets are also rich sources of calcium, vitamin and proteins. These are devoid of harmful food colours or chemicals and thus can be easily served to kids. Now what if someone is diabetic? There are a wide variety of sugarless cookies, packets of dry fruits available from branded confectionery shops to bring smile on their faces. G. Pulla Reddy Dry Fruit Decorative and Karachi Bakery Sugarless Chocolate Chip Cookies are few such examples. So be it Diwali, Raksha Bandhan or Holi, a pack of assorted sweets can bring smile on the faces of your loved ones. These days sweets are just not available in traditional forms but also as cupcakes or chocolates and other innovative forms to match the taste and style of modern India.